In the midst of all this March madness, a window of opportunity is closing for landowners to get a jump on early planting of native seeds by frost seeding. As the name implies, frost seeding relies on frost-producing temperatures. In the North, you likely still have a few opportunities, while those in the South might have already missed the shot clock. Planting early gives native plants a better chance of having their dormancy broken. Giving your seeds a jump start can be an advantage over waiting until the soil warms up to plant. 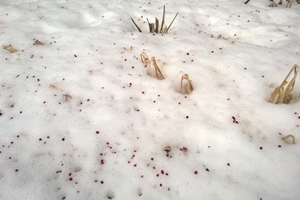 Mother Nature’s frost seeding: staghorn sumac (Rhus typhina) seeds on the snow. Frost seeding is a means of broadcasting seed directly onto the snow or, preferably, bare ground during the late winter and early spring months, in conjunction with the freeze-thaw cycle that typically occurs from day-to-day at this time. Frost seeding can be done any time after the end of the previous year’s growing season if the risk of the seed being washed off the field is very low. The method takes a cue from nature’s playbook, mimicking the seed disbursing process of many native species during fall and winter months, and allowing natural processes to occur which thin and soften the seed coat, helping prepare the seed for germination. The introduction of moisture, which freezes and thaws, as well as the friction of seeds rubbing against grains of sand, soil, gravel and each other, help to accomplish this seed coat preparation. A key to successful germination is the establishment of good seed-to-soil contact. This is where frost seeding makes things interesting. An example of ice needles, illustrating the potential for movement of seeds during the freeze-thaw cycle. Soil heaves during the spring freeze-thaw cycle — rising up as the water in it freezes at night and dropping back down as the ice thaws during the day. You’ve likely seen evidence of this as you walk in fields or the forest this time of year. 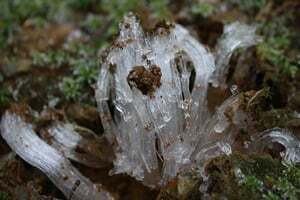 Crystalline structures called ice needles protrude from the surface, often curling around into delicate structures of soil and ice before thawing and disappearing as the day warms. Seeds on the ground will be worked into the soil during this process, establishing good seed-to-soil contact and further conditioning the seed for germination. A key to successful establishment of any meadow is control of pre-existing vegetation, particularly rhizomatous species and non-native and/or invasive species. If you have invasive species on your site or its perimeter, it’s critical to take control of those species before frost seeding. If that work was not completed last fall, your frost seeding efforts might prove for naught, as problem weeds will likely take over in the spring. After pre-existing vegetation is controlled, it’s wise to mow and remove any of the remaining thatch (dead vegetation). If not, you will not achieve good seed-to-soil contact essential to success during and after frost seeding. The best candidate for frost seeding is areas with bare or exposed soil. Once you have a site ready for frost seeding, the easy part begins. 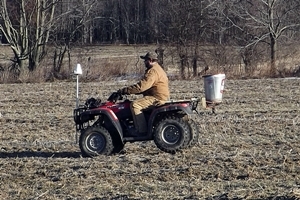 Frost seeding a stubble field with an ATV-mounted seeder. no-till drill can also be used to frost seed under the right conditions. It will increase the efficiency and uniformity of the seeding, but you are limited to ground that will support the equipment. On sandy soils where there is little or no swelling and shrinking associated with the freeze-thaw cycle, broadcasting without some additional incorporation does not work. A no-till drill is a good option for this type of site if you can get over the site without creating ruts. Heavier, more dense seeds do better than light fluffy seeds. The fluffy seeds are more prone to being washed away by rain, rapidly melting snow, or blown off the site by the wind before the freezing and thawing action can incorporate them into the soil. It’s important to remember when spreading mixes that some species fly differently than others. If using a broadcast seeder, determine the pass width that maximizes uniformity by focusing on seeds that fly poorly and keeping the pass width within a range that ensures they will be dispersed evenly. Early morning frost seeding, before the soil surface begins to thaw, is recommended. If the soil surface is “slimy,” wait to seed until you get another morning when the soil has frozen again. Mix your main seed (and cover crop, if using one) with a sufficient quantity of kitty litter to make 100 pounds of material to spread per acre. The litter serves as an anti-clumping agent and helps with even dispersion of the seeds. Spread half of your mixture evenly in a weave pattern that goes forward and back, left to right; then spread the other half in a weave pattern that goes in a perpendicular pattern from the far corner to the one where you started. Your frost seeding is now complete. And that’s a good thing. You need to see how your bracket’s holding up.